What do you like about living where you do? Lots. I like that Wellington is such a beautiful city, surrounded by green hills and a sparkling harbour. I love the steep hills, the crazy twisted roads, the endless singletrack in and around the city, the interesting mix of professionals, government workers, and more alternative types, the jungle-like bush that covers the hills, the coffee, the art, Cuba Street, the mountain bike community. What do you dislike about living where you do? Normally my only complaint about Wellington is its weather, but this summer has been incredible. How did you start out riding MTB? I started my affair with the bike on a stationary spin bike at the university rec centre where I instructed spin and aerobics classes. Some fellow instructors were keen mountain bikers and I tagged along with them on rides on the Port Hills. First bike? A mini 10-speed. What was the best thing about this bike? It was pink and red. And mine. You're a well trained and somewhat 'decorated' lawyer. What do your contemporaries think of all this mountain biking malarkey you're into? I notice that I get strange looks when I turn up to work in my business attire, accessorised with fresh bruises and grazes on my arms and legs. How many years have you been riding at elite level now? Since 2005. So, a long time. What do you see as the highlight on a sporting level of your time racing thus far? Probably my result at the 2011 World Champs in Champery, Switzerland. I'd had a really tough couple of years where illness and doing too much study had made racing a real struggle. I doubted whether I'd be able to get a top result again. To finish 7th, particularly on such a technical track, was really exciting. How about a highlight on a personal level form this period? I'm most proud of getting through a PhD at Oxford. That was hard! What does your average week day look like at the moment? I don't really have an "average week day" - which is just the way I like it! I've got lots of interesting things going on this summer, and the main challenge is trying to fit them all in. My main paid employment is being a legal/policy consultant at the "Productivity Commission", which is a government research agency. I work flexible hours, at the office and from home. It's sweet. I'm also helping Ash Burgess and W.O.R.D. with some kids' mountain bike instructing. That's really fun and satisfying. I'm on the MTBNZ executive committee and helping with the set up of Trail Fund NZ. Also satisfying. And around those things I ride my mountain bike, write, run, drink coffee and beer, do art classes, do some yoga. And neglect cleaning my bathroom. Oh well. Now you're a full time Enduro racer how has your daily schedule changed compared to when you were a full-blown XC whippet? I cram more varied activities into my day now compared with when I was XC focused. But I normally worked or studied while I was racing and training for XC, so I don't feel that my schedule is that radically different. I definitely spend less time on the bike now than when I was training for XC; my standard ride now is probably around two hours. And I don't have a set training schedule or do structured training sessions. The main difference is probably that I am more relaxed now than when I was in full blown XC mode. I can now say "yes" to going on adventures and social outings. Fun. Indian or Thai? Thai. But I'd prefer Mexican. All-time favourite MTB rider? Eeek, I don't know. What's wrong with mountain biking? The wanking on about bike bits. 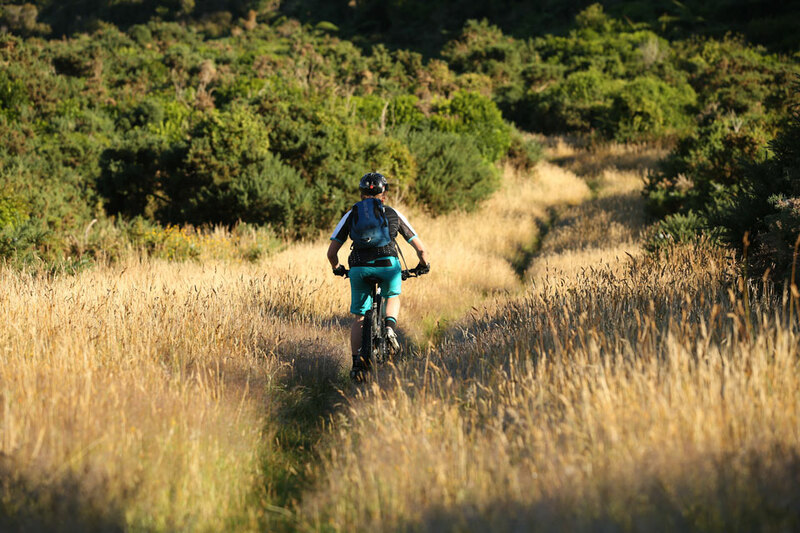 What's right with mountain biking? It enables you to have a little slice of adventure and joy in every day. And I've come to realise that that's very important. All-time favourite piece of MTB kit? At the risk of contradicting my answer to the question about what is wrong about mountain biking, I do love a dropper seatpost. It makes riding downhill way more fun and safe. I hadn't used one until mid way through last year, but now I feel lost without it. Apart from that, I'm loving my new turquoise green shorts. They're pretty. What are your vices? I'm hard on myself and can also be hard on the people I'm close to. I sometimes (often?) try to take on too much. I drink girly beers. Who do you look up to? Anyone who works hard, is passionate about what they do, likes adventures, and doesn't get trapped in the mundane. What's the biggest lesson you've learned in the last 10 years? It's good to take risks. Finish this sentence. On a Saturday I like to... get up, do a long fun mountain bike ride with friends, finish at the Lyall Bay waterfront, eat an amazing burger from the burger trailer parked up in the car pack (seriously, the best burgers I've ever eaten), have a nap in the sun, go out for Mexican and a whisky cocktail, then go to a hot and sweaty music gig.